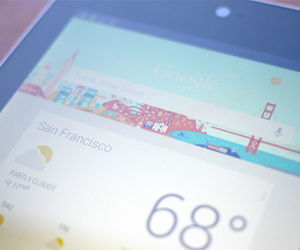 Google’s Nexus 7 tablet is not exactly a surprise. Nor is the fact that I’m able to work on a review of the product just hours after the device was announced. For years now, Google has had the uncanny habit of not only making big announcements at its I/O events, but then immediately sharing what it has shown off with developers and members of the press. This year was over the top. 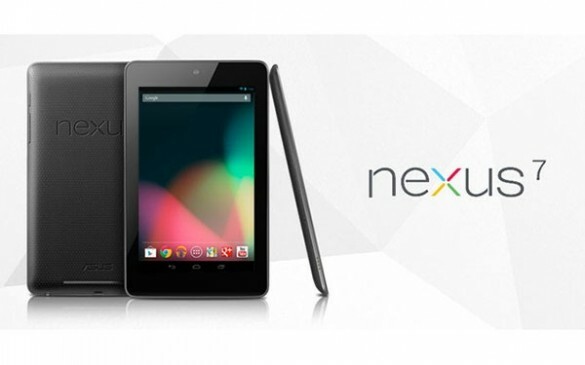 Not only did Google hand out its new, 7-inch, $199 Nexus 7 tablet, but it also introduced a new version of Android (4.1) called Jelly Bean, upgraded its flagship phone, and... rolled out the Nexus Q. Perhaps the most odd of all, the Q is a spherical media player / amp which functions as a wired audio and video output for all of your Google content. But the main course is obviously the tablet — a stock Google experience with a price point clearly meant to put a hurt on Amazon’s Kindle Fire, and sway potential buyers of Apple's lower-end iPad 2. Android as a tablet platform has stumbled thus far — can Google finally begin to make an impact in an increasingly crowded market? Read on for my full review to find out. the Asus-made Nexus 7 is impressively built and styled. Like most other tablets, what you mainly see is a glossy, black-bezeled display. In this case, that display is ringed by a matte silver band which looks like metal, but is a rigid plastic. Around back, the device is covered in a soft-touch, dimpled material which has the feel of taut leather. Amusingly, Android design chief Matias Duarte told me that the idea was to mimic "Steve McQueen style" driving gloves — and the effect is definitely there. On the bottom ridge of the device is a Micro USB port and on the right side (in portrait mode) you’ll find the volume rocker and sleep / power button. On the left edge, there are surface “pogo plug” connectors for a dock, and on the front of the Nexus there’s a small camera embedded in the upper bezel. The tablet weighs 0.74 pounds (compared with the Kindle Fire’s 0.9 pounds), is 0.41 inches thick (the new iPad is 0.37 inches), and measures 7.8 inches tall by 4.7 inches wide. 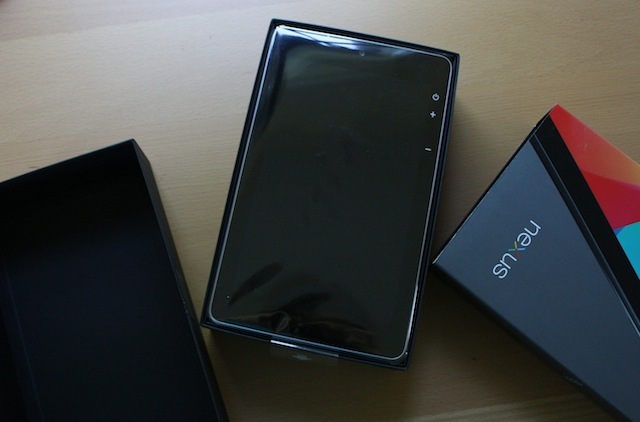 In all, I’m impressed by what Asus and Google have done with the Nexus 7. It’s a classy, well-made product from a design standpoint. It may not be the most original, thinnest, or lightest tablet on the market, but it’s certainly a respectable and refined entrant to the race. Bottom line — this is a much better feeling and looking tablet than anything else in its price range. Inside the Nexus 7 you’ll find a quad-core Tegra 3 CPU clocked to 1.15GHz on four cores (or 1.3 GHz when running on just one), 1GB of RAM, and 8GB or 16GB of onboard storage (that extra storage will cost you an additional $50). Sorry, active downloaders — there’s no microSD slot here. In fact, the Nexus 7’s back panel is not removable at all. The device also packs in Bluetooth 4.0, Wi-Fi 802.11b/g/n, and has a GPS chip, NFC, gyroscope, compass, and accelerometer. It’s also got a 1.2-megapixel front-facing camera, as well as a speaker embedded around the back of the device, and what appear to be a pair (there are two identical holes) of built-in microphones. That camera isn’t really useful for anything but Google+ Hangouts and the like — though it certainly gets the job done. If you’re one of those people who likes to snap pics with their tablet — first, shame on you. Second, you’re probably out of luck here. There’s no camera app on the device. You can find a third-party replacement, and I did get one to work, but most of the popular camera apps don’t even show up in the Play Store. There’s no 3G or 4G data service onboard, and the storage limitation might be vexing to some users, but there’s also little to complain about for a tablet at this price. In terms of sheer specs, there’s nothing here to prevent the Nexus 7 from being every bit as useful and usable as its bigger counterparts and competition — even the iPad. The Nexus 7 boasts a 1280 x 800 LCD display that’s covered with "Corning glass," which I assume means Gorilla Glass. The screen is 216 ppi if you’re keeping count — and it shows. Text and images look crisp and clear on the 7-inch screen — not Retina display quality, but not too far off either. Colors on the screen looked a bit washed out when compared to the Super AMOLED of the Galaxy Nexus, but I’ll chalk that up to the exaggerated saturation of that phone’s screen. Next to the new iPad, things looked a little more balanced. Viewing angles were surprisingly good too, though I don’t spend a lot of time looking at the screen off-center. For those of you that do, fear not. Performance on the Nexus 7 was zippy. Snappy. Buttery, if you will. We already know that the Tegra 3 chipset is no slouch, and it felt particularly slouch-free on this tablet. General OS performance was excellent — helped undoubtedly by Android 4.1 and its "Project Butter" initiative which is said to vastly improve touch response and smoothness in Android. Apps were also quick to open and close, and speedy in use. In particular, 3D gaming that was optimized for the Tegra chipset looked stunning and held steady frame rates, and basic tasks like multitasking were nearly instantaneous. I do have some minor gripes about some of the scrolling action I saw. I think in an attempt to smooth out and stabilize the performance of Android, Google may have created some very minor "snap back" issues when scrolling around quickly. To my eyes, this is definitely a software problem, but I didn’t see similar issues on the Galaxy Nexus with Jelly Bean, so this will remain a question mark. Simply put, sometimes when you’re scrolling quickly (say, on the homescreen), the scroll will not follow your finger, and instead snap back the page to the one you were trying to move away from. I only saw this crop up occasionally when I was moving around at speed, so I don’t think most users will notice or care. It’s a nitpick... but that’s what I get paid to do. In the short period of testing I’ve had so far, battery life seems pretty solid — certainly about what you should expect out of a device of this size and with this technology footprint. In our rundown tests, I squeezed roughly six hours out of a fully charged device on 65 percent brightness, with webpages loading constantly. Your mileage when gaming, watching video, and using more CPU-intensive apps will obviously vary. I'd also expect significantly higher battery life when using the Nexus 7 for simple tasks like video and music playback that allow the Tegra 3 to fall back to its power-sipping “companion core,” but unless you’re using it as an overgrown PMP or you’re on a really long flight, you won’t stay in that low-power mode forever. In general, the amount of power drain felt relatively predictable, but that's not necessarily a bad thing. I didn't find myself reaching for a recharge while I was putting it through its paces, and I expect most users will have a similar experience. 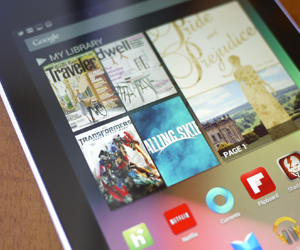 A massive part of what makes the Nexus 7 the tablet that it is, is of course Jelly Bean. The announcement of the device wasn’t just significant for its hardware and price point — in some ways, the newest version of the Android OS is really the main attraction. Google took huge leaps forward in usability and design with Android 4.0 (Ice Cream Sandwich) last year, and based on what I’ve seen in the 4.1 release, the company shows no signs of slowing down when it comes to tweaking and refining this OS. If you were getting used to Android feeling like a complete OS, this will reinforce that feeling. For starters, Project Butter makes a big difference. According to company reps, Jelly Bean now has a consistently higher frame rate for screen animations and movement than any previous version of the software. Additionally, the company has improved finger tracking, making touches more accurate and natural; historically, Android devices have lagged iOS just a hair for touch responsiveness, so this is a big deal. In practice, Jelly Bean does seem smoother and cleaner than ICS, though I don’t think it’s a sea change coming from 4.0. If you were getting used to Android feeling like a complete and cohesive OS, this will only reinforce that feeling. But in general, things like multitasking and moving into and out of apps seem faster and more responsive, and those long waits for your app list to pop up seems to be all but killed. There are other kinds of cleanup in the OS. For instance, the app selection dialog that lets you pick a handler for specific tasks is now much more visual. Roboto has also grown up a bit — Duarte told me that the company has created new weights for the font, and you can see Roboto Light all over the OS. It looks particularly fetching in the new, easier to read notifications. Notifications have undergone a big change, with window shade popups now being both actionable and expandable. That means you can see a better view of all the new email you’ve gotten, share images right from your notification bar, and even email groups you’re meeting with if you’re going to be late — all without going into an app. Expanded notifications can be opened and collapsed with a two finger gesture, but I wish Google would add a toggle to keep them all collapsed unless otherwise specified — sometimes it can be too much information at once. You can also long-press notifications to jump directly into the App Info screen, where you’ll be greeted with a checkbox to turn off all notifications for that app. It’s not the most elegant solution I can think of to manage notifications, but it works to quiet a noisy app. Little, important changes abound. For instance, you can now create keyboard shortcuts (text expansion) in your personal dictionary, and Emoji has been added as an optional key set (huzzah!). The keyboard has also gotten overhauled on the back end, with a new predictive text system which will try to guess the next word you’ll type (kind of like SwiftKey), and a new algorithm which the company claims will learn and adapt the more you tap away. That’s a welcome change, since I was getting tired of typing "tine" instead of "time." 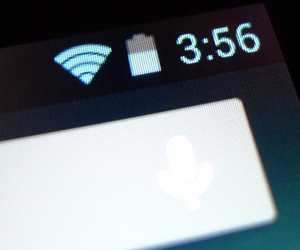 Another big change is that dictation can now be handled offline, which means you can do speech-to-text whether you have a connection or not. The calendar app has been updated with slight drop shadows and new coloring, while animations that take you into and out of applications now sweep upward and down when you choose them from the multitasker. Google has also cleaned up its menu options in settings, made its toggle switches more flat, and added easier access to accounts. Maps now includes new offline options, making it easier to select big areas all at once — though weirdly it doesn’t just allow you to pull entire cities. 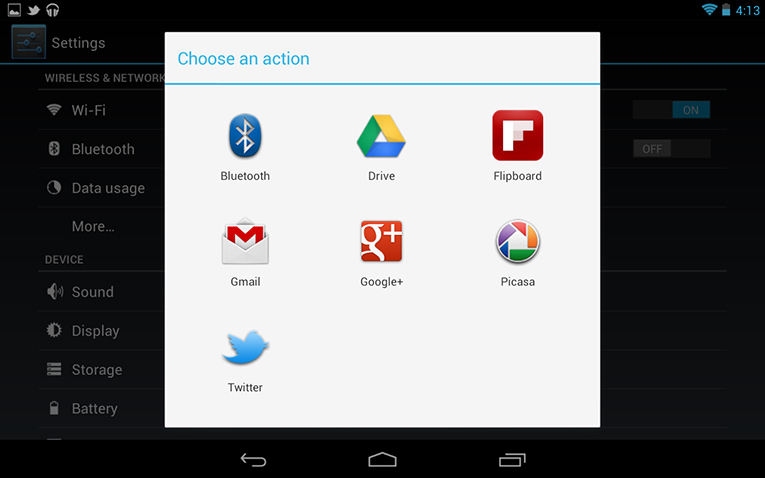 Chrome for Android is also present as the stock browser on the Nexus 7, and it performs excellently on the device. In particular, syncing with your Google account and real, usable tabs stand out as highlights here (as do the easy-to-access menu options). Especially in light of the version of this browser released for iOS today (and its issues), it's clear that the Jelly Bean tablet instance of Chrome is as close as you can get to a desktop experience on a mobile product right now. And that experience is pretty fantastic. On the homescreen, Android is now more iOS-like due to the fact that icons will auto-rearrange when you move objects. In addition, widgets that don’t fit on a screen will now resize themselves instead of being rejected. One thing that struck me as odd, however, is the fact that the homescreen doesn’t have a landscape view. 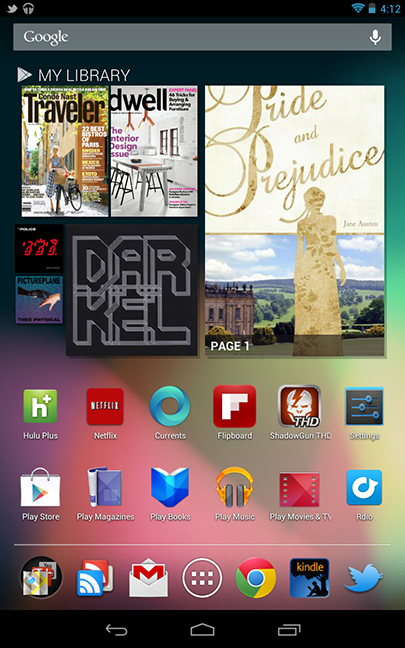 As in, you cannot turn the tablet to landscape when you’re on the homescreen. It’s actually a bit frustrating when you move from a landscape app back home — and I can’t figure out why Google would have removed this functionality, which was present in Honeycomb. The camera and gallery apps have gotten some tweaking as well — with a new, Windows Phone-style method of viewing your latest photos. From this new "film strip" view you can also toss away pictures you don’t like, mirroring the way you tossed away cards in webOS. Duarte was the mastermind behind webOS’s card interface, so it’s no surprise to see it back again here. And of course, Google has updated and added to its content offerings in Jelly Bean, bringing TV purchases to its video store, and adding magazine issues and subscriptions in a new app. The latter works well (better than the Fire or Nook in my opinion), though the content selection is rather thin right now. As a consumption device, Google has gone a long way to filling some of the gaps in its ecosystem, even down to giving users new widgets that put their content front and center. 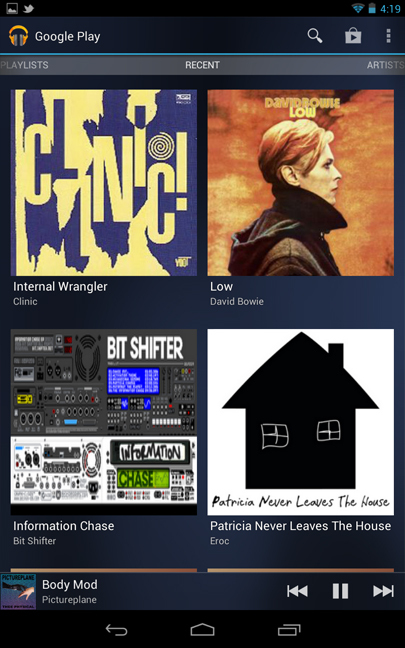 The new Play choices make sense and work well with the Nexus 7, though they still don’t match up to Amazon’s breadth and depth — especially when you factor in the company’s Prime offering. But perhaps the biggest and most important change in Jelly Bean is the appearance of Google Now — a big evolution of natural search. 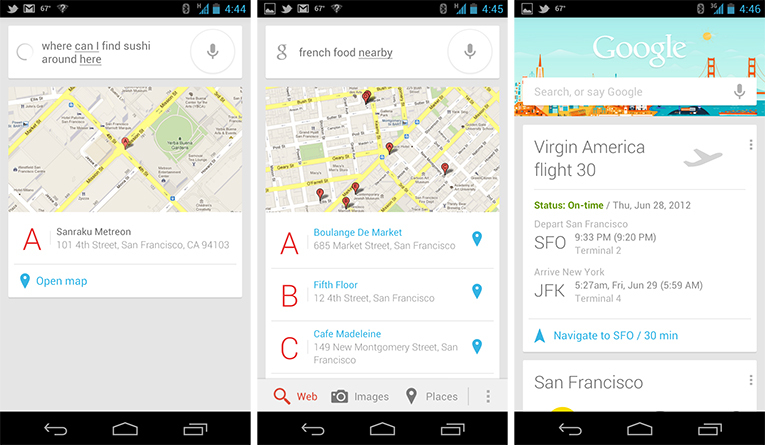 Google Now functions much like Siri at a glance (though you can type or speak your queries). It’s got a fantastic, very human-sounding female voice to read back responses, and it’s utilizing similar logic to Siri for regularly-worded questions, like "where can I find sushi around here?" 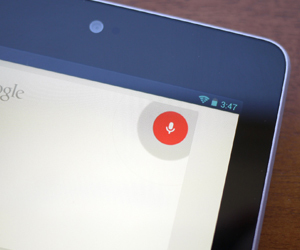 Google Now goes much deeper than just voice recognition and AI. It actually learns what you do through searching and starts to identify patterns. Additionally, it will give you information before you even ask for it. For instance, in the short period of time I’ve been using Now, it became convinced that I lived at my hotel in San Francisco (sad, I know). When I went out earlier today, it prompted me for directions back to my "house." Of course I corrected it and gave it my actual home address, but the functionality is fascinating. Later, when I left the hotel for the airport, Google Now presented me with a map and an estimated travel time of 27 minutes without having been asked to do so. It then repeated this magic when I landed. I’ve searched for the red eye flight I’m on tonight a few times, and now the card with my flight info is waiting for me when I open Google Now. According to Duarte and others from Google, it will get smarter and gain functionality as time goes on — and I can see incredible uses for the service. As Matias said, it’s not an app, "It’s a platform." Now is far from perfect, and it certainly can’t go toe-to-toe with Siri in every department — but it’s also not supposed to. After only using it for a couple of days, I’m deeply intrigued and excited about its possibilities. It’s doing something that computers rarely can pull off without becoming annoying — which is thinking for you — and so far it’s doing a relatively good job in its limited way. Now feels like science fiction in many ways. Like a future technology that got here a little early. One final note on software. While Google’s new OS and latest app initiatives are very, very good, Android on tablets still suffers from an incredible lack of developer support. Mainstream apps like Twitter have yet to be updated to an appropriate tablet-friendly design, while others, like Pocket, seem to be slightly optimized but not working 100 percent correctly. Some apps simply aren’t optimized for the tablet in any way. The Android 4.1 SDK is now available to developers, so hopefully that’ll be changing soon. There are some very good experiences to be had on the Nexus 7 — and frankly, even the un-tweaked Twitter app looks pretty passable on the 7-inch display — but this is still a problem Google needs to tackle if it’s going to truly combat competitors in the space. It’s an excellent tablet, period. In fact, it’s the first Android tablet that I can confidently recommend to buyers — and not just because it’s got a low price tag (though that certainly helps). It’s a well-designed, powerful, and useful product, with lots of bells and whistles that makes it feel like a device that should be more expensive than it is.